Cape Poge Lighthouse on Martha's Vineyard, Mass. On Chappaquiddick Island on the northeast point of the Cape Poge Wildlife Refuge, also referred to as Cape Pogue Wildlife Refuge, it is open for public tours to the lighthouse tower in the summer months, and the refuge itself. 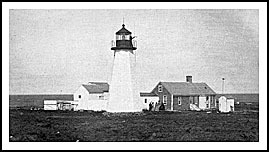 To help direct traffic with Edgartown's whaling business flourishing in the early 19th century, Congress provided funds to build a lighthouse at Cape Poge in 1802. In August 1856, while Daniel Smith was Keeper, a young teenage girl was in a small boat, which was starting to fill with water, was being carried out with the tide. His young son heard the girl's cries for help and quickly grabbed some friends in another boat. They successfully rescued the young girl in time. Her grateful father contacted the Vineyard Gazette and published a note of thanks to the boy and his friends. During a winter storm in January of 1866, a schooner ran aground on a sandy shoal near the lighthouse. Most of those on board perished from exposure as they clung to the icy rigging. As the storm wore on for days, the destroyed vessel was not recognized for nearly four days after the incident. One man survived, but in surviving with much frostbite, he had to have parts of his hands and feet amputated. He later ran a successful newsstand in nearby Oak Bluffs. Erosion was a constant problem with the lighthouse causing it to be moved a number of times. The reconstructed 1893 tower was moved first in 1907, then 95 feet inland in 1922, and then in 1960 it was moved back another 150 feet. The tower had to be moved back again about 500 feet from the eroding shoreline in 1987, by helicopter. The lantern was restored to its near original condition in 1997 and continues to serve as an active navigational aid. Visitors who feel in shape for a 3 1/2-mile hike one way through loose sand can walk to the lighthouse. The Trustees of Reservations offers a selection of guided and self-guided tours during the summer season that help visitors explore the Cape Poge Wildlife Refuge as well as the historic Cape Poge Lighthouse. 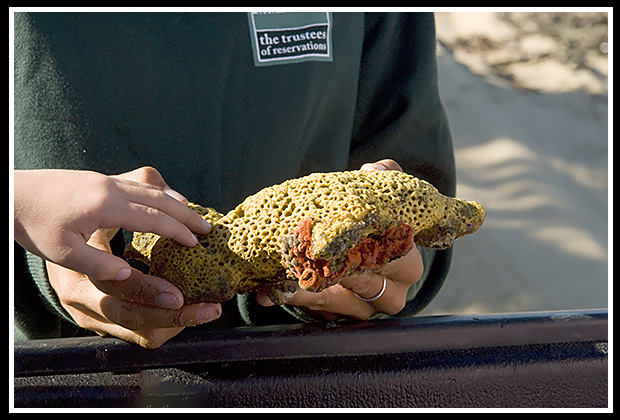 Expert naturalists lead all guided tours. There is a free shuttle that will pick up visitors from the “Chappy” Ferry. 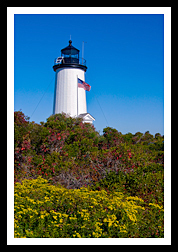 Another option allows visitors to take their own four-wheel drive vehicle to Chappaquiddick Island and drive to Mytoi Gardens, from where the tours start, purchase a permit, and then drive to the lighthouse. From Edgartown-Chappaquiddick ferry, which will take a few vehicles at a time, take Chappaquiddick Road for about two and half miles. At sharp right curve, continue straight on Dike Road (dirt road) for about a half-mile to Dike Bridge. Continue over Dike Bridge to Cape Poge gatehouse and entrance. Most of the ferries mentioned don’t pass by the lighthouse, but provide services to get to the island of Martha’s Vineyard. The Chappaquiddick Ferry operates between Edgartown’s Memorial Wharf and Chappaquiddick Island and provides quick service for visitor to explore Cape Poge Lighthouse. 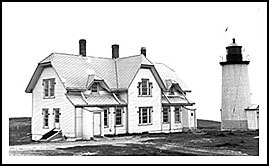 The Trustees of Reservations provide land-based tours of Cape Poge Lighthouse and the local wildlife refuge area. They also promote kayak tours, which are available to get views from the water. 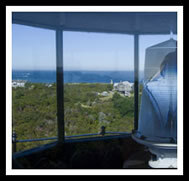 Tours of Cape Poge Lighthouse and wildlife refuge area. Bus and trolley tours of the island. 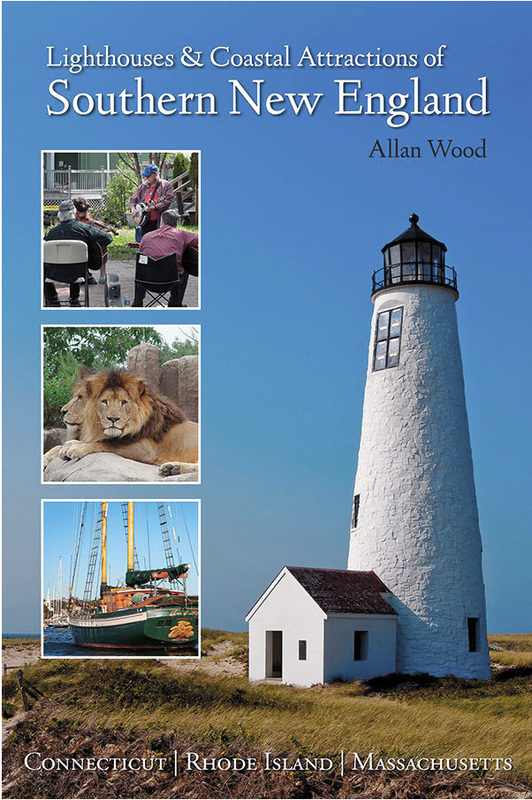 My book, Lighthouses and Coastal Attractions of Southern New England: Connecticut, Rhode Island, and Massachusetts, provides special human interest stories from each of these 92 lighthouses, along with plenty of indoor and outdoor coastal attractions and tours you can explore.